Everyone in the knitting world knows who Claudia of Wollmeise is. She and I have had two yarn swaps since August. The first time she sent me sock yarn and this time she sent me her worsted weight yarn. I have a huge love of Malabrigo, so this yarn is heavenly! She sent me 3 colours: Farn, Rittersporn, and am kaltan Polar. They are gorgeous!!! Omg a finished object. . .
Yeah I have been doing a little bit of knitting in the past 2 weeks. Not as much as before. But, oh well. Below is a Cherry Garcia knit out of Brown Sheep Lamb's Pride Bulky. It's actually really warm. Boy's socks are coming along slowly, but surely. I knit a lot of this sock on the plane trips. Yeah, fun. . . I started knitting a scarf out of the left over Brown Sheep from my Hunter's Cables hat. I may rip it and knit another hat, tempting considering I hate knitting scarves. I also have been doing some spinning, below is some wool/tencel blend I dyed up and spun. It wasn't as hard as I thought it would be, but didn't turn out exactly how I wanted. Below is the Spunky Eclectic fiber club. This is Icelandic wool and I LOVED it. It's not the softest wool I've even felt, but I adored spinning it. I also purchased a pound of grey Shetland wool from Amy to try and because it was pretty cheap. Boy's younger sister Kate turned 15 on the 17th and I was thinking of knitting her something, maybe an Ailidh hat. Her room is completely pink, so I pulled a lot of pink yarns. I'll figure something out to knit. Lost in Manhattan. . .
Soo umm. . . yeah. . . 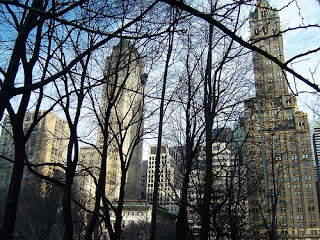 I went to New Jersey this weekend to visit Steve and my Valentine's Day gift was a play in Manhattan. We went and saw "Crimes of the Heart" directed by Kathleen Turner. It was actually a very well put on play at the Roundabout Theatre. It was quite an adventure actually finding the theatre. . we kind of had the wrong address (my genius boyfriend's fault) and wandered around Manhattan for most of the day. It wasn't bad, considering I hadn't been there in ten years, but still =P I did get to see the new Apple Store (gorgeous outside, hot as hell inside and crowded). 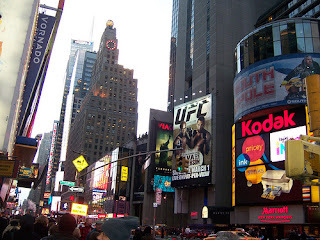 We also wandered to Times Square, yes wandered and other places. Overall it was quite a fun day. Mac stayed with my sister in Iowa while I was away and apparently was actually good for her. . . .what's with that dog? So bring on the pic I guess. 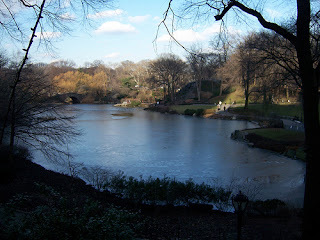 . .
Central Park, just because I thought it was pretty in he fading daylight and I figured I needed pictures. 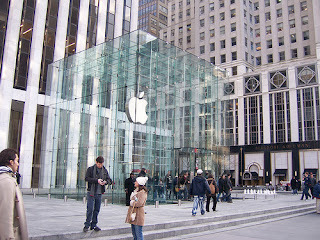 . .
Manhattan while trying to find the theatre. 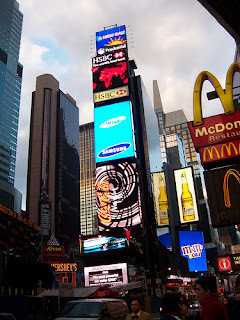 . .
Times Square again. . . It took the University of Iowa until 9:15 this morning to cancel classes!!!! 9:15!!!!! Below are pictures of our lovely snow, oh and we're supposed to get 6 to 10 more inches by 6pm tonight. Lovely eh? Mac is 19 inches tall from his shoulders to his paws, not a tiny dog. He swims/bouncing around in the snow. Thats how tall it is. Beautiful eh? Today is a day to work on homework, knit, drink coffee, play World of Warcraft and watch movies. . . .ahhh snow days. . . Boy Knits and Where the hell is this snow coming from?? Below are pics of knits for boy. Yes, they are all blue. . . he likes blue. I personally am a green girl. But, yes BLUE. First we have 2 pairs of socks, both superwash thank god. Then we have the beanie which I ripped shortly after this photo was taken. There were too many stitches and it was too loose. The yarn is my Sundara sports weight. I also pulled out my sock scraps for no apparent reason the other day. I have no idea why, but I thought I'd show you. Hahaha, yes I finished these socks finally. . . .took me long enough, but they are definitely cozy and soft. Mac today in the snow, he loves running around and eating it. It's sooo adorable! More snow from today. . . hope classes are canceled tomorrow. . .
And Mac in the snow this evening. He obviously is happy the world is white. =P Drivers today may not have enjoyed it, but I know the kids in my neighborhood will love having class canceled hopefully tomorrow and going down the big hills on their sleds all day. Ahhh childhood. Miss being a kid during these kinds of days. And no, I didn't watch the Super Bowl.